A slipknot is a knot that tightens up easily once you place it on the needle. 1. 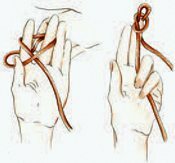 With the tail end of the yarn in your palm, wrap the working yarn around your index and middle fingers, and lay the working yarn across the tail end, forming an X. 2. Spread your fingers slightly and push the working yarn through your fingers from the back of your hand. 3. Pull this loop up slightly while holding the tail end of the yarn to form a knot. 4. Place the loop onto the knitting needle and pull working yarn to adjust the tension.